Why Are We Afraid Of The Songs The Rebel Sang? 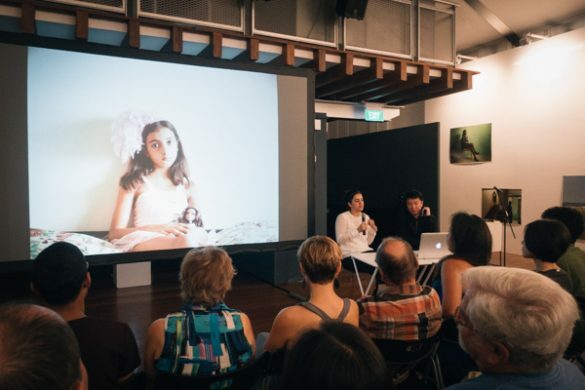 In Conversation with Newsha Tavakolian, with SIFA Festival Director Ong Keng Sen, 2nd July 2016. 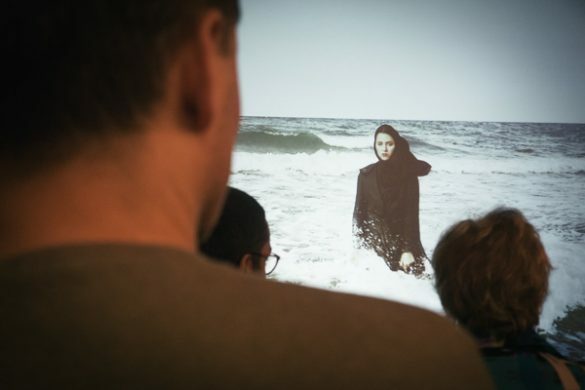 Firstly, kudos to Singapore International Festival of Arts (SIFA) Director Ong Keng Sen for embracing a rich, and very journalistic, photographic work – Newsha Tavakolian’s I Know Why The Rebel Sings – in what is billed as the premier national performing arts festival in the country. Newsha Tavakolian’s exhibition was part of SIFA’s O.P.E.N. pre-festival public engagement initiative. O.P.E.N. meaning Open, Participate, Engage, Negotiate. 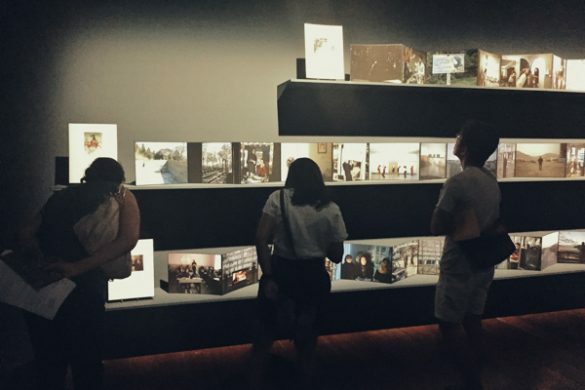 Last year, SIFA exhibited renowned Chinese photojournalist Lu Guang’s The Price of Neglect. I went to Lu Guang’s talk, as I did with Newsha’s on Saturday 2nd July. I remember Lu Guang, an unassuming stout and tanned man who looked very much like the blue-collar factory workers he photographs, describing his extensive documentary work of pollution in China as exposing sores on a big, healthy body. Newsha Tavakolian’s ‘I Know Why The Rebel Sings’ exhibition. Now, Newsha’s no stranger to a discourse on censorship and intervention. Her LISTEN images depict the plight of silenced female singers (songs again) in her home country. Women are banned from performing solo in public and producing their own albums in Iran. 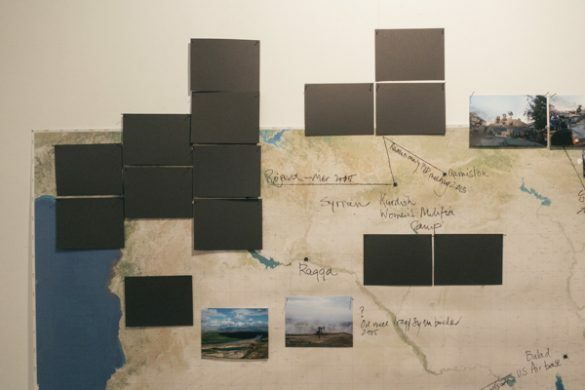 Blank Pages of an Iranian photo album rose from the ashes of a public dispute over censorship and representation in her 2014 Carmignac Gestion photojournalism Award. The award’s patron, French investment banker Edouard Carmignac, had intervened with the integrity of the work and dismissed her title for a more sensationalised “The Lost Generation.” Newsha withdrew from the award and returned the €50,000 award money. During her SIFA talk, Newsha spoke briefly about this episode, a very emotional one she notes. “Never let people with money change the integrity of your work” Newsha stressed. During the talk, there was a wonderful reading of Newsha’s written essay A Thousand Words for a Picture That I Never Took. 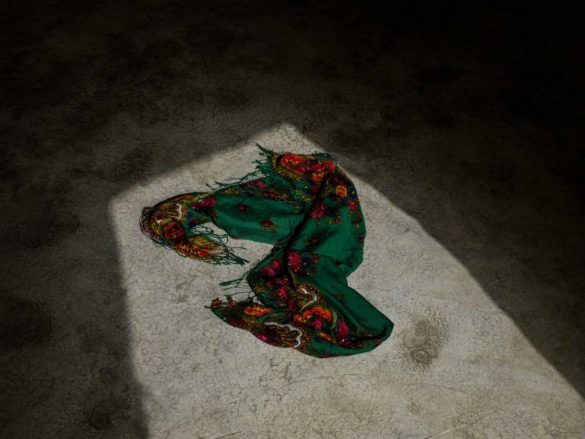 A final food for thought on ‘silencing the song the rebel sang.’ We learnt that the photograph below by Newsha, of a fallen scarf, deep green splattered with blood red ornaments, illuminated by a harsh sun and caged by shadows, romantic and aesthetic, was allowed to be exhibited, but only without its caption. Newsha Tavakolian’s I Know Why The Rebel Sings curated by Vali Mahlouji is exhibiting at 72-13 till 9th July.